clip tinting would be EXTREMELY useful in order to both reuse assets in multiple scenes, and tweak colors together in general. Probably if you put a rectangle over it with some alpha, you can tweak colors. Makes sense? yep, as i mentioned, i've done this, and it works absolutely fine with black, but it would be great to have colorization which isnt simply a linear blend. 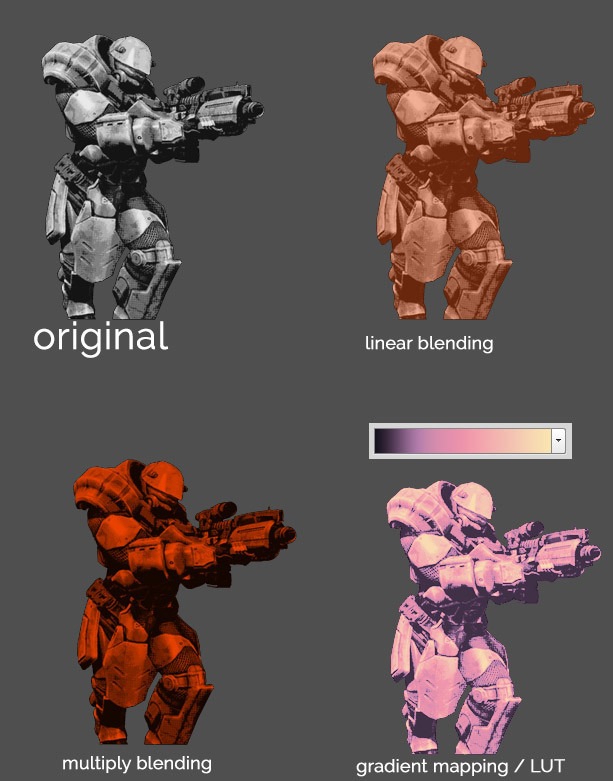 it's hard to use linear blending effectively because it brings all color values closer together towards the target color rather than truly modifying them. multiply blending (or overlay blending) is more useful for colorizing images. Got it. Thanks for this suggestion. Not sure we're gonna support this soon in the editor. If our player would support image manipulation for specific elements so with some js code you could tweak blending modes, would it be still valuable for you? actually we have experimental support for that feature, but to push it into production requires some more time. I would say end of the Spring.